Ned particularly likes our 2009 Pinot Noir. Our customers rave about the 2011 Pinot Gris. The critics agreed. Sunset Magazine– 2011 Pinot Gris received a Silver Medal. Portland Monthly – 2009 Pinot Noir placed in the Top 50 Wines of Oregon, 15th in the Pinot Noir category. More than 580 bottles were submitted, the preponderance Pinot Noir. Over the years our wines have received some top-notch notices. These latest confirm that our chosen winemaking style meets a high independent standard. For you our customers, the recognition affirms your personal taste in choosing Lazy River Wines. We’ll continue our farming practices and wine making styles. Our winemaker Robert Brittan exudes energy and what I would call “wine intelligence.” His understanding of the vineyard’s soils and climate and their combined influence on the wine in the bottle, greatly affects his winemaking decisions. It is exactly what Ned and I want for our wine. Robert’s collective experience in viticulture and winemaking spans 30 years, 16 as winemaker and estate manager at Stags’ Leap in Napa. We enjoy telling of his attention to detail with this story. On Christmas Day of 2011, he was thinking about our Pinot Gris. Was the fermentation finished? Robert was so concerned he went to the winery, checked the alcohol levels and stopped the fermentation. The remarkable wine speaks to his dedication. There have been important changes at Lazy River. 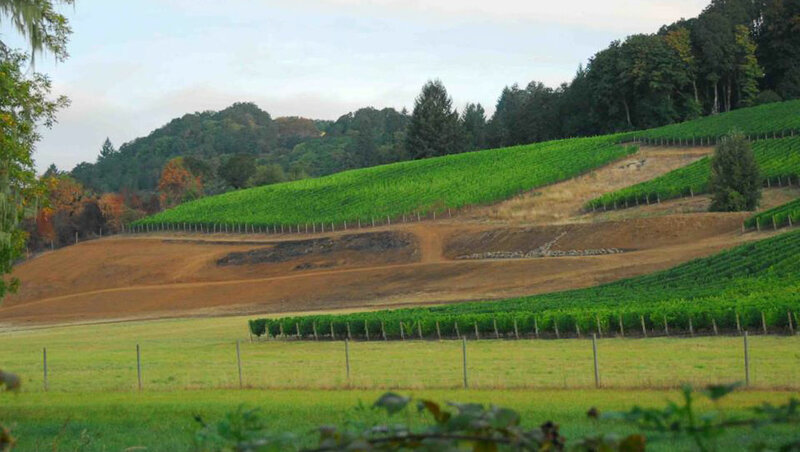 This spring we planted four more acres of Pinot Noir, using older California varieties, Mt. Eden and Swan. This planting is named the Streeter Roy Block and memorializes our dear friend who was a cattleman, farmer of Lazy River’s hay fields and life-long resident of Yamhill-Carlton. We can say with confidence that we have a new vineyard dog, two year old Mario. An Italian pooch bred for truffle hunting, he did not prove himself to be of much use in the vineyard during his first harvest in 2011. This year, much to our relief, he took up his responsibilities. Just as the grapes seemed to ripen, he began nibbling individual berries. Sure enough the sugars were higher. We readied the harvest bins and began setting picking dates. For anything you might need, please contact us at Lumpkin@LazyRiverVineyard.com.